Legend has it that this week is International Scone Week. 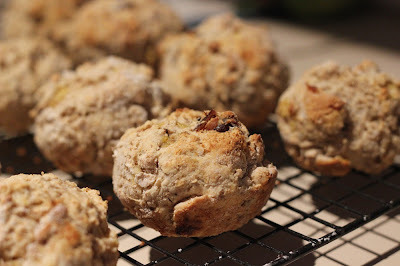 With two very ripe bananas in the freezer, what better opportunity than to give my mother-in-law's Banana and Date Scone recipe a go? I haven't had much success in the past making scones, and find the lemonade version much more foolproof than the traditional recipe, but think I may have gotten a bit of technique sorted in my last couple of attempts, with help from my food processor. Here's the recipe, as my mother-in-law defines it, with not quite exact measurements. I think it takes a bit of experience and observation to gague just how much of the flour and milk to add. I replaced plain SR flour with wholemeal and found it worked just as well. Preheat a fan forced oven to 220C. Lightly grease the holes of a 12-hole muffin tray. Mix butter and flour on low speed in a food processor until the mixture resembles fine breadcrumbs. Alternatively rub the butter into the flour with your fingertips. Transfer the mixture to a large mixing bowl. Add the mashed banana, dates, cinnamon and almost all of the milk. Slice through the mixture with a butter knife until just combined, adding more milk if necessary to bring dough together. With floured hands, turn dough onto a smooth surface and break gently into 12 even pieces. Place one piece into each hole of the muffin tray. I prefer this technique over cutting the dough into rounds as I find it removes some of the handling which can toughen the dough. Bake for 10-15 minutes or until slightly browned. These are a tasty, healthy snack that are best eaten warm, with or without a little butter. As with all scones, they are best eaten the day they are baked, but if you find you have leftovers at the end of the day, they freeze well. Thirty seconds each in the microwave is all they need to defrost. Happy International Scone Week! Yes, I have made many a rock scone in the past, so any opportunity to reduce dough manipulation and I'm there. Nice looking scones. Happy scone week.